When my partner popped the question back in September, I already knew where I wanted to get married. I wasn’t one of those little girls that planned out her wedding down to every last, minute detail as a child, but as my relationship with my now fiancé has progressed, I have mentally and subconsciously started cataloguing wedding ideas and, more importantly, marriage wants and desires. While some couples spend months pondering where to tie the knot, we knew right away that we wanted to get hitched at the summer camp near my parent’s house. This isn’t a typical wedding venue (more popular right now are barns, vineyards, and back yards), so we had no problem booking the venue in advance, save for a small amount of date reservation drama that was the result of a change in camp management. We didn’t choose this venue for any reason other than the fact that we love it, but since we’ve booked, we’ve realized just how much money we are able to save by booking a summer camp as our venue. Since most people don’t get married at summer camps, it’s not like they have a lot of price competition. The happy result of this is that our venue was substantially cheaper than even renting out a hall. The venue charged us per person for the day, and we get it from the night before at around 7:00 PM, and have to be out the day after our wedding in the early evening. For the majority of the weekend, they charged us $12/person. Since our wedding is sort of a destination wedding, being 4 hours away from where we currently live, we’ll be looking at likely fewer than 100 guests, and I’m guessing around 70 is the more realistic number. This brings us to only $840, and because of the date reservation drama, they gave us 15% off the venue, allowing us to save even more. News flash: summer camps are gorgeous! The scenery certainly speaks for itself. It’s on a lake, with plenty of beach and greenery surrounding it. Beautiful flashes of colour come with the rustic cabins and fleet of canoes, as well as the bright white dock and pretty, natural stone fire pit. While we will have some décor, we were able to save a lot by using the natural beauty of the landscape as a backdrop for the reception. 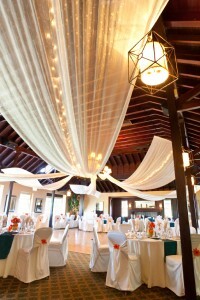 The venue will also make for some great wedding photos, so I’m sure our photographer will love it. We were looking at prices of table rentals (and logistics with respect to getting the tables out to the venue) and after the sticker shock of seeing how much a table rental costs, realized that the camp likely has tables already. After all, they have to feed the kids and families that stay there. A quick inquiry brought me to the conclusion that yes, the camp did have tables, and they had more than enough for our use. The use of the tables came with the venue and while they are certainly not fancy tables, we will be covering them with table cloths anyway. The fact that the camp has tables will save us upward of $120. Most camps (including the one we are having our wedding at) also have sound systems, bench seating, and an industrial kitchen with freezers, fridges, dishwashers and everything you could possibly need. We bought plates and flatware for the wedding with the intention of selling them after, and because the camp tableware is so .. campy, we are glad we did. The camp we chose also cuts down on our guest’s costs of attending, since we have the camp overnight. People can bring a tent or stay in one of the terribly rustic cabins so don’t have to worry about booking a hotel room or calling a cab. It was a happy surprise to see how much our venue was saving us on wedding costs, though we likely would have chosen that venue regardless of this. What venue did you choose for your wedding? Wow, summer camp as your wedding venue is truly an unforgettable one! I’m sure your guests will have a good day during that time! I saw some photos on Pinterest about summer camp weddings and they are amazing, especially for the nature lovers. Yes, lots of nature so the scenery speaks for itself! That really does sound beautiful =) We got married in a small wedding chapel in my hometown then went on to have two different receptions (My husband and I are from different parts of the country). It was all fairly cheap but I wouldn’t have done it any other way! I’ve been pondering a cheaper venue like this, but then the cost of bringing everything in- dance floor (if it’s outdoors), food, dishware, tables, etc. adds up so fast. We’re lucky because there is a huge gazebo at the camp so we don’t have to bring in a dance floor. I think lots of those costs would be incurred at almost any wedding venue. What a great venue idea! I’m sure it will be beautiful and fun for everyone. I got married years ago and chose a venue out of state (but in a state where we have family) to reduce our costs. We found an inexpensive hotel with a courtyard and had a great wedding for under $5,000 (including everything). It saved us a ton of money and was really nice. Wow, that’s a very reasonable cost for your wedding! And we thought WE were saving a lot, haha! That sounds awesome and like a great amount of savings. Wish I would have thought of that! Sounds to me like you’re creating a wedding that fits your personality – I wish I would have done something like that. Much of what we did for our wedding was due to tradition. If I could do it over again, I’d have a gigantic BBQ, and create an experience that when people looked back at it, they would say something like, “That’s just like Brock to do something like that!” Hope the rest of your planning goes smoothly! That’s something I try to shun – traditions that don’t matter to us (and most of them don’t) but I think it’s difficult because tradition matters to so many people. That is so clever, I love it! Sounds like a great venue and what a smart way to save on costs. I can’t wait to hear all about your actual big day and the exciting honeymoon to Asia! We didn’t even realize that it would save us that much until we began planning!